Chilling Adventures of Sabrina returned last Friday with nine episodes of satanic supernatural shenanigans featuring everyone’s favorite teenage witch. 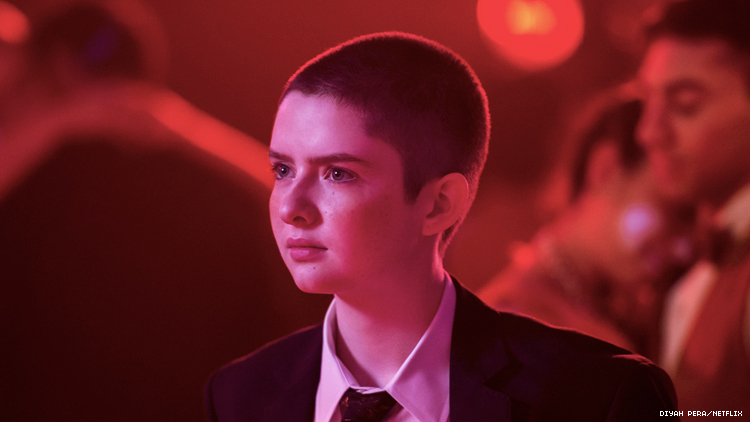 But in the latest installment of Netflix’s buzziest show, the most compelling character arc wasn’t the spell-casting lead, it was her mortal best friend Theo, played by queer actor Lachlan Watson. In part one, Theo was clearly undergoing some kind of discomfort with his gender, but besides some spooky affirmations from his ghostly trancestor Dorothea, that journey mostly meandered while the focus shifted to whether Sabrina would sign the Dark Lord’s book (spoiler alert: she did). In part two, Theo is one of the few characters with real agency: he joins the boys basketball team (with a little magical assistance) and nonchalantly tells his friends he’s changing his name, comes out to his dad as trans in a surprisingly moving scene, learns what the cost of magically transitioning would be (turning into a tree and forced amputation, yikes! ), and eventually helps save the world from the hordes of hell. Out caught up with Watson to discuss the importance of trans representation, telling new queer stories on screen, and whether Theo might get a love interest next season. Was your character's identity something that you knew from the start of the show or something that developed along the way? I definitely knew that Theo was trans when I got cast. Funny enough, the role I actually got cast for was under a completely different name and it was for a character that had already transitioned into being a trans male. And then a week before production Roberto called me and was like, "Hey, actually how would you feel about starting female and showing the transition?" And I was like, "Sure." So I've actually known the whole time and it's been really cool to be able to follow along with the journey as opposed to just being there to the end. Were you able to work collaboratively with the writers about Theo’s transition? Did they want your input and your thoughts on the character as a queer person yourself? That's tricky. It's tricky because yes and no. As writers, their job is to write and create these beautiful and intricate characters. And their job is to know the intricate details of all these people's lives and create that. But then there's the other side to it where, part of the reason that I got cast was because right when I sent in my tape, like an hour later I ended up Skyping with our creator Roberto [Aguirre-Sacasa] and I ended up telling him my entire gender journey. And I think that really influenced him because I think Roberto was really passionate about casting a queer actor to play this queer role. There came a lot of times when there were things in the script or there were moments or there were thoughts that I had about the character that I felt was really important to talk about. The coming out scene was [an instance] where they wrote this really beautiful coming out scene, but it still felt like something was missing. As someone who's come out three times in my life, I really took that opportunity to start a conversation and to speak with the writers and Roberto about coming out as someone who is genderqueer in any shape or form. There was definitely that space to have a conversation and it was this beautiful, supportive environment. It was also just very interesting for me as a queer actor to be able to find my voice and to be able to start those conversations and to be able to sort of stand up to my character and stand up for the community that we're representing. That was definitely a lesson for me to learn as well. Did you feel a sense of responsibility portraying a transition on screen? And what was important to you that you get right about it? Oh God, yes. There was a lot of pressure. It's kind of absurd. I don't think I realized how much pressure there was until halfway through when I just had that moment of like, wow. I'm in a position to speak to an entire generation of people. But it was really important to me to play a character that represented a new kind of queer person that the world may not have seen before and tell a story that the world may not have heard before. In the entertainment industry, a lot of the queer characters and the queer storylines that we tell, they've all just sort of blended together to become this one mass copy paste trans person. And it was really important to break out of that mold and to show someone who was powerful but still questions and [is] still unsure and strong in their vulnerability because that's something that so often gets just totally overlooked. One of the biggest conversations around queer characters in media right now is the issue of representation and who gets to play queer people? What is the significance of you, an actor of a similar experience to your character, getting to portray that on screen? It's really important. It's a question that is very polarizing and that I have a lot of different perspectives on as both a queer artist and as an actor. There's definitely two sides of this story of representation, and it's been really interesting being able to sort of toe the line and walk right down the middle. But ultimately I think it comes down to the fact that I have never seen myself reflected back on screen in the story. I've so rarely found a character, person, and actor in anyone that looks like me, and thinks like me, and is telling my story. And so first and foremost it was so important for me to able to be that for people, and to be able to be that for myself in a way, and to show that representation matters and that people like me exist. But there is that part of me that wants to someday get to the place where queer people don't have to just play queer characters. That I can be the chameleon that I've always wanted to be and to be seen as just another person instead of just another queer person. It's definitely a tricky road, but it's been really amazing for me to be able to be a part of that conversation and to be able to push a new narrative forward. I'm just excited to see what else in store and where I get to go and the stories that I'm able to tell. One of Theo’s biggest moments in part two was in episode four, where all the characters live out these different fantasies and Theo gets to see what would happen if he used magic to aid in his transition — and it’s not cute. Was that a turning point for him? It was a very interesting moment because you go right from that story to the scene a couple episodes later where mandrake Sabrina comes to Theo and offers to transition him completely. And Theo says, "No. I already feel like I'm enough for myself." That was the first time that I'd ever heard that and [seen] that narrative told on screen. Where it's something that took me years to get to and that I am still working on myself, being enough for myself and being okay with who I am regardless of what the world tells me what I should be or how I should look. Even for me as an actor, watching that tarot card scene and seeing myself in a way transition, and to hear my voice deepen and to see my little pin head on this body builder dude's body, it was sort of overwhelming. It was weird because it was finally like, oh wow. I'm the ideal, I've made it. I'm exactly how the world has told me I should look. And it was this really uncomfortable moment where I was like, I never wanted to look like that and I don't wanna look like that now. And then I think being able to tell that story through Theo and showing that looking like that and being that “perfect person” isn't everything, and it's not the only thing that you can be. Have you gotten positive responses from trans people who have connected with the character? I've gotten that a lot, which is really amazing for me. I've even gotten it just from my queer friends and my trans friends and even just my friends who are sort of on the forefront of the body positivity movement. It's a story that everyone can relate to, that you don't have to fit this perfect mold. You don't have to be exactly what society tells you you should be. You are allowed to be enough for yourself. On a show that has the literal Devil as a supporting character, Theo is one of the more grounded characters. So why do you think that's so important to keeping the storyline balanced? In such a magical show you definitely need that balance of having someone to relate to. I feel like Theo can be the one to relate to in so many ways on so many levels, not just for queer kids watching the show but also just the outcasts or the people looking from the outside in. A couple of the moments where Theo's the third wheel and Theo's the mortal and Theo's the short kid and Theo's sort of the comic relief, and I think there's a lot to be found in that where Theo's just this really human person with these really human thoughts and feelings and goals. And I think that's something that's so important to show and for people to relate to. It's been cool to be that because then once again moving back, your character gets to be more than just the queer best friend tag along. Your character gets to be this big grounding factor and just this human person that everyone can find a piece of themselves in, and that's a really cool story to tell. What would you want to see next for Theo? It would mean a lot to me to be able to explore gender nonconformity with Theo and to be able to show the thought process of that on screen, because it's already been so amazing to be able to show the thought process and the journey of becoming a trans person. But it would be even more incredible to show that queer journeys don't just have to be jumping from point a to point b and then you're done; you're finished, you're fine and you're happy. That you can evolve as a person and your ideas and your life and your identity can change and fluctuate and there's beauty to be found in that. That's another story that doesn't really get told. I think a lot of people could take a lot away from that story. And it would mean a lot to me to be able to tell that story, but I think even if that doesn't happen, just continuing to explore Theo's idea of self and explore that self-love and that self-care, just taking time to explore and talk about that would be amazing. And maybe throw a queer love interest in there just for fun. Theo definitely needs a love interest. Watching the show this season there was a moment where I got kind of worried that maybe the bully was gonna become that, and I was very happy that it didn't go that direction. I had that moment too when I read that script. I was like, wait wait wait, 'cause Roberto had cracked a couple jokes about chucking a love interest in there for Theo next season, and then I read the script where I was like, this is a very intimate moment between me and the seven-foot tall man, I don't know how I feel about this. So we'll just have to wait and see, but I want it to be some queer androgynous academy person. I want Theo to get their hands dirty in some witchcraft, that's what I want. So we'll just have to see. Do you hope that the way Theo’s story has played out is the future of how queer people get to be represented on TV? I sure hope so. I really hope that queer actors can continue to play queer characters. But part of me also hopes that queer actors can become more than that, that we can just be seen as actors and be seen as the chameleons that we really can be. I don't know. I hope that this open a lot of doors for a lot of different roles and possibilities for the future of queer art. It'd be really cool to find more of that freedom that we've been looking for with Theo.